To find the total length of a flat spiral having outer end radius = 15.5 units, inner radius = 5 units & the increase in radius per turn = 0.81 unit, the total No. of turns in the spiral is 7.5. This is an example of an Archimedean Spiral, otherwise known as an arithmetic spiral, where the arms get bigger by a constant amount for each turn. We can see Archimedean Spirals in the spring mechanism of clocks and in vinyl records (used by the recording industry before CDs and MP3s); and in tightly coiled rope. In this case, it's not possible because it has a fundamental flaw. So the outer radius cannot be 15.5 units if the increase per turn is 0.81. The increase per turn is 1.4 units. Before we can find the length of the spiral, we need to know its equation. b affects the distance between each arm. 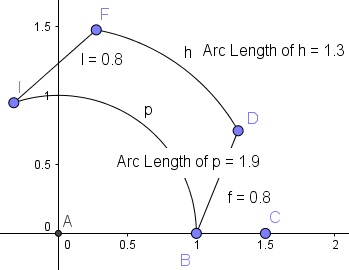 For both spirals given above, a= 5, since the curve starts at 5. 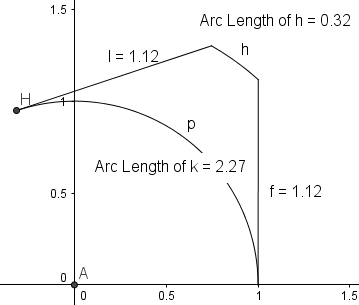 We'll use the formula for the Arc Length of a Curve in Polar Coordinates to find the length. The starting value for θ is a = 0 and after 7.5 turns, the end point is b = 7.5 × 2π = 15π = 47.12389. You can see where that final answer comes from in Wolfram|Alpha. It may be possible to find the actual integral on paper (it involves hyperbolic functions), but why waste our lives doing so? We are interested in the length, not pages of algebra! I've solved the second one as an example in the section Arc Length of a Curve in Polar Coordinates. So Anantha, I hope that helps to answer your question. See the 55 Comments below. These plane geometry equations are simple and beautiful . The explanation is very clear. Hi, thanks for this explanation. I'm trying to work out the number of turns for a given length of spiral, (I'm an engineer for a garage door company, need to know turns to specify springs), I don't suppose you could give me some pointers getting N when I know L? I could use Solver in excel but I need to do it hundreds of times. @Brent: You can't solve it by any straightforward algebraic or calculus process - not that I can see, anyway. Is your distance between each spiral always constant? If so, I'm wondering if you can do it by getting a good approximation, then do a few actual calculations to zero in on the number of turns required. For example, in the example in my post, the "average" radius of all the spirals is around 10 (1/2 way between 5 and 15). We know the length is 379, so the number of turns would be about 379 / (2 * pi * 10) = 6. This misses by quite a bit. But a better "average" radius is 8 (obtained by working backwards from the known information), and this gives us the number of turns 379 / (2 * pi * 8 ) = 7.5. Let's try 2 other lengths and see how we go, and I'm assuming our distance between spirals is constant at 1.4. (1) Length 250 units. The average radius will be less - let's guess (for now) 7.5. Using this and the integration formula, gives 238, which is not bad for a reasonable guess. A small tweak or 2 would get you there. (2) Going the other way, let's see what happens with length 500. The average radius will be more, say 8.5. Applying the length formula, gives 520, which is once again pretty close. A few tweaks and we'll be very close. Now, I don't know whether that would save you any work compared to what you are doing now. But maybe if you created a table with a bunch of "good" guesses and the resulting number of turns, and then used some kind of linear (or probably non-linear) interpolation, you would get close each time for a given length. Does that help or am I describing what you're already doing? I'll describe what I ended up doing. I looked at the integral on the wolfram link in your blog post, saw it was a pretty regular shape - looks like a rectangle of width 2.pi.n and height average of top and bottom points. I put all this into an Excel table and used a data table to calculate length for n=1,2..10. Then I graphed n-L and found that there's a quadratic trendline with and r^2=1 fit. So I used the linest function in excel to estimate the constants in the quadratic equations based on my table of n and L values, and used that to drive the rest of the excel table which calculates the required springs. (I used the quadratic equation formulae to find the roots of the quadratic. 5 years at uni learning maths, used it once now in 9 years of engineering...) I needed to have it in spreadsheet because I have to do this for every height and width combination of the door. I couldn't have done any of that without your blog post. Thanks again. Brent. Glad you got it to work, Brent. And you're not the first engineer who has pointed out the lack of utility for much of the math learning at university. Of course, some engineers have got to know some of it, but maybe we need to re-think what is contained in the compulsory math components of engineering degrees. The thing about learning all the maths that you do in an engineering degree is not that you'll necessarily do all the things in your career, but that some of the subjects you'll do at uni require it. If you don't do the maths that lead up to it, then you're never going to be able to cope with thermodynamics or fluid mechanics. And you do need to be able to go through some of the maths in those subjects to truly say you understand the basic concepts. The trouble is that there are simply so many fields that an engineer will go into, and you need to give an understanding of the fundamentals of just about everything: thermodynamics, fluid mechanics, structures, kinematics, control, electrical, materials etc etc etc. I might not have used the higher level maths much since leaving uni, but I've definitely used my understanding of all those subjects on a regular basis, and I gained my understanding by going through the maths. What I would say to my 21 yr old self if I could: keep better track of your notes and text books, because it might be a decade before you need that information again but you will kick yourself if it's lost forever. Also, on the original posting with the spacing of .81 units, the OD of the spiral should have been 11.075 units not 10.67 units. I think you solved for 7 turns, not 7.5 turns. Thanks for your input, Neil. Hmmm - seems a lot simpler that what Brent and I were talking about! Thanks for spotting the error - I have amended the post. As it turns out for a garage door I don't know the OD - it's going to change depending on N.
This is a bit late, but new readers may still find it usefull. Another way to make a quick approximation is to take the average 🙂 For the first spiral in the article, inner radius is 5, and outer radius is ~ 11. The average radius is then (5+11)/2 = 8. The circumference of a circle with radius 8 is 2*pi*8 = 50.27. 7.5 turns of that length is 8*50.27 = 377.25. This, IMHO at least, is reasonably close to the 'exact' 378.8. No matter how you look at it, you need three of ID, OD, N and L to compute the fourth - you cannot 'just' deduce N from L if you dont know ID and OD. But knowing ID, OD and L, you can quickly make a good estimate based on circles with diameter (ID+OD)/2. Note, that both of the above formulae are approximations based on concentric circles, rather than a true spiral. However, the end result is reasonably close. Also note that it is diameters, not radii, you need to plug in! @Jacob - Thanks! We get closer and closer to a good approximation with each new post. Ok I'm trying to solve something for a fiction story and it's been years since I've done calculus. So maybe someone can solve this for me. If you wanted to travel to the galactic core from Earth you would want to travel down the spiral arm and not through the less dense regions if you needed to resupply. So Earth is about 7900Kpc from the galactic core. The start of the spiral arm at the end of the galactic bar is about 3000Kpc from the core. I do not know the distance between the arms. What I'm trying to figure out is how far you would travel down the spiral arm to get to the galactic bar. Any help would be greatly appreciated. Thanks. I think the dotted magenta distance is what you mean from your description. Before we go any further, is it correct? I think for something with the precision like this you could use the pythagorean approximation just fine. I'm not a mathemetician, but I have an archimedian spiral question too. I would like to create a plastic spiral for developing long lengths of cine film. If the film length is 15 metres (15000mm), and the inner radius of my spiral should be 20mm, and the outer radius maybe 150mm. Ideally I would like about 2mm spacing between the winds. How many turns would there be? The spiral will always need to be 15metres long, but I might like to experiment with different radii, spacing and number of turns etc. is there a formula that helps me do the maths for this please? @Robert - thanks for the Excel-based approach. I am a co op student and i am trying to make a roll of scotch tape in NX 7.5. I am attempting to use Law Curve to create a spiral line for an extrude to follow. how does the math (r = a + b?) equation or formula flow to create this? the roll needs to be roughly 15 mm thick and the total radius is 32.2 mm. (1) What does "NX 7.5" mean? Does that help to get you started? R.A means nx7.5 software. My query is similar. 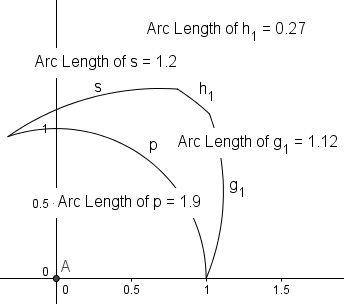 I want to draw a arithmatic spiral with the help of law curve in nx7.5. Pl. help. Thanks. @Singh: Thanks for the heads up about NX7.5. It looks like great software. You just need to use the same formula, r = a + b θ, as explained in the article. You can use t instead of θ. You just need to use the same formula given in the article. It makes sense, as our distance is slightly less than if it was 5 times around the outer rim. I don't believe there is a formula for the other way around. But trial and error is quick and easy when using a computer algebra system. It makes a lot of sense. I will use it in my experimental plan and will let you know. hi Murray and people! maybe you can help me! this is for an opensource hw project! This is basically a copper spiral path. I want to define the overall Resistance and seize: OD (ID could be zero). Since the material is copper and given the standard pcb layer height of 35 um, this resistance just depends on the section width. Lets call it E.
maths with a purpose are such fun! In differential form we can write. r = r0 +n*θ where n is spiral constant, r0 is inner radius, r is spiral radius at any angle. Note: θ is in radian so for example if we have 10 turns spiral, then θ = 20*pi. How can i get the value of increase in radius? @Merry: Near the top of the article, it says "the distance between each arm is 2πb divided by the number of turns". Do you know your a and b values in this formula? r = a + bθ. I was trying to solve a problem very similar to the 'galactic spiral' problem posed by Ray Brown. In my case I was thinking of an airplane travelling from a ground point A to ground point C climbing steadily until it reached it's highest altitude H at the midpoint B. The distance travelled from A to B would be an Archimedean spiral and this is the distance I wished to calculate. However, it dawned on me that I had already calculated the great circle distances for A to B at ground level (gcg) and for A to B at the altitude H (gch). In other words I new how far a car would have to travel along the ground from A to B (gcg), and I knew how far a bird at altitude H would have to travel from A to B (gch). One can then think of the distance travelled by the airplane as the same as that of the car but with the horizontal scale smoothly changing from gcg to gch as it progresses. So the distance travelled would be the average: (gcg + gch) / 2. So, then I thought of applying that to spirals. 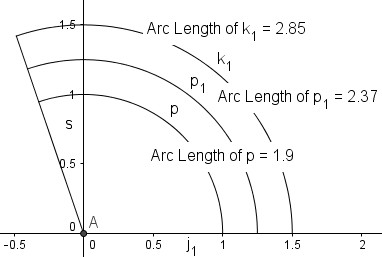 It seems to me then that the length of a spiral segment covering θ degrees could be expressed as the length of the circular arc of θ degrees with a radius that is the average of the radii of the segment's end points. Am I wrong? My math is not nearly good enough to be sure. @Clive: Sorry about the delay in responding. This may be too late, but for what it's worth, here are some images that may help. Let's assume our aircraft is partially going around the Earth, which I've drawn with radius = 1. The altitude of the aircraft is 0.5 (totally unrealistic, I know, but exaggerated so we can see what's going on). Another possibility is your spiral suggestion (the second spiral is a bit off in my diagram). The distance now is 2.37. I'm not sure we can conclude anything so far, but just wanted to indicate some possibilities. BTW, I did the above diagrams using GeoGebra. It's an invaluable tool if you want to play with such questions, without getting bogged down in algebra. Two scenario questions from someine who, obviously, is mathematically ignorant. The first concerns spirals made up of a set total length of "coil" and set distance between turns. The second may represent an infinite-length "coil" of percentage-proportionate distances. Firstly, does your formula work for spirals going down to [tetminating at "a central-core point] zero (if such is accurately possible)? If such For example, if the spiral has 10 full turns, each turn is separated at an equal distance of 1. Would the formula work to determine the diffetent lengths of each full turn? Secondarily, what if the distance between each turn differs by a static percentage relative to the length? Example, if the length of the first full turn is 10, the distance between its start point and the start point of the next inner turn is 1 (10% of the length). Ten, the distance between the 2nd and 3rd points would be 10% of the length of the 2nd full turn. Likewise, the distance between the 3rd and 4th would be 10% of the 3rd's full trun length. Etc, etc. Is there a formula yo determine the lengths of each arm in the series? I assume a spiral such as this would never realy achieve zero, but continue reducing in turn length and distance at each full turn. Yes, you can use the formula to find the length of single spirals. I'm not sure about your second case - I somehow doubt there will be a smooth join for each new arm of the spiral. Hi there, I am trying to find the equation to a spiral I have but I havent been able to understand how to find parameter b.
I dont know if its necessary but the spiral has 10 turns. Is there any way I can find parameter b with this info? @Francesca: Since your inner radius is 2.05, it means a = 2.05.
outer radius − inner radius = 14 − 2.05 = 11.95. "2πb is the distance between each arm." In this image (made using GeoGebra) you can see it goes from 2.05 to 14 in 10 spirals. With a clock hairspring the inner diameter and outer diameter of the coils remains constant at it’s attachments but so does the length of this spiral. So as the inner part of the coil is wound or unwound as in a watch then pitch cannot remain the same. @Mark: Yes, in the case of a watch spring I imagine it will only form a spiral when it is completely unwound. In the wound state, the outer ring of the spiral becomes more straight, and the inner rings become more circular. @A7: Do you mean ? Actually, you won't be able to solve that on any calculator because is not defined. Can you solve for the amount of rotations when the only given information is the inner radius, the length between each arm, and the total length? @Alex: Please see Neil's comment (#8). I believe his formula should help you. this post helped a lot and I am glad that one can find such a valuable information. I have similar problem with different inputs.I have a disc rotating with certain r.p.m and a pin advancing with constant speed (mm/s) I know the staring Diameter and the stopping. could I calculate the length of the track? and what effect the diameter of the pin have on the resulting length? @Abugheneda: Yes, your situation can be calculated using the formulas given in the post. For the last part, I don't think the pin's diameter will make any difference to the length, unless the pin is very thick so that it affects how far apart each spiral is. @Murray: You are welcome. One thing i should point out, that got me stuck a bit, is if you are integrating say vectors at each point of this spiral curve (e.g, forces) then leaving them in purely polar form will not work. These vectors have to be projected into their components since integration is a simple addition type operation, while adding vectors uses a parallelogram law except for vector components that lie on the same axes. To bad because it makes for some very,very long equations when applying Castigliano's method to an Archimedean spiral spring. will my equation be 'r=a-b*θ'? I believe it would be correct. The distance will be the same whether you are thinking about it stating from the outside moving in, or inside moving out. @Murray Hello nice article. Mind lending me a help please?. I'm having some problems at trying to use your formula for calculating the length of a spiral in a CD. In my book the spacing between each arm is given as and the width of the reading sector spans between to . But for purposes of better precision I left it as indicated. , which is the distance from the origin. So with this upper boundary is established. Note: I couldn't make it to work with so instead I used as a variable. This part is odd, well I'm not very familiar with the use of Wolfram Alpha. So the result is a value very close to what can be obtained from a formula given above. Both answers seem to check with what my book says the answer. If I were to calculate this for my problem what would be the value of the second spiral? Why is the distance between each arm and not just . When I followed your steps I felt mostly as reading a cookbook but I was left with the impression of keep investigating into this. At the end of your article you mentioned something about that the actual integral on paper would require hyperbolic functions. Does it mean that it cannot be solved using the ordinary integral methods found in most textbooks?. I'd like to know how could that integral be solved without much fuss as this left me intrigued. I've attempted to reproduce the integral by replacing with letters A and B as constants but Wolfram Alpha rendered the results with log and none involving hyperbolic functions. Could it be that what I did was wrong? I'll appreciate so much that you could help me clearing out these doubts. @Chris: I'm impressed you entered all your math using LaTeX! (1) Where the 0.22282 comes from? I amended the post to more clearly indicate where that value came from. (2) If I were to calculate this for my problem what would be the value of the second spiral? I'm not sure what you mean here. I discussed 2 spirals in the post, but you only appear to be talking about one? (3) Why is the distance between each arm and not just ? I have seen it written both ways. I happen to be using the first. (4) Does it mean that it cannot be solved using the ordinary integral methods found in most textbooks? You can quite easily integrate hyperbolic functions - I chose not to as it was beyond the scope of this post. (5) Wolfram Alpha rendered the results with log and none involving hyperbolic functions. Could it be that what I did was wrong? Looks OK to me. But we just need a numerical answer, so no need to worry about the algebraic (indefinite) integral. So Wolfram|Alpha thought you wanted that constant, and didn't realise you were using as a variable. Using x, t or theta are usually "safe" variables for computer algebra systems like Wolfram|Alpha. Thanks for your kind words of compliment. In fact I have some experience by using LaTex due I'm constantly asking questions on math in different forums. But so far I found your post the most informative one. Concerning to the value you referred to 0.22282 I totally overlooked the fact that the OP made a question which "cannot be solved" since apparently assigned an incorrect jump or spacing so that the No. of turns in the spiral to be 7.5 and that cannot be achieved using 0.81, so you made clear later if the distance is 1.4 units then the number of turns would be 7.5. I thought this would apply in my case. But the problem I posed was correctly made. The recent edit you made explained it better and this by extension answers the second question. However the third question is where I'm still stuck at. Why is not "transformed" or "equated" to whereas in problem is and not that's the thing which I'm not getting it. Could it be that it can be related to this formula? If so what is the justification? Is this used to transform from meters to radians? I'm just as explained confused about the meaning of parameter and how is it different from . Again If that's the case (if it is transformed) I don't understand why one gets its value to stand as it is and the other requires the transformation?. Since they are both real numbers already why one has to change and the other not?. Mind you explaining this to me a bit better?. You mentioned something about seen it written in both ways. This latter comment I don't understand. What did you meant by written in both ways? Where is the second one? I am a bit rusty with integration methods but upon an inspection on what I recall I don't find what transformation or change of variable should I use to integrate the function obtained in the end. When you mentioned that it is okay to you about the logarithmic functions in the resulting integral obtained by Wolfram Alpha did you meant that there was no discrepancy with the supposedly hyperbolic function which should appear in the answer?. How can this happen?. As mentioned (and i can understand that it was beyond the scope of the question) I'm curious of how to obtain the indefinite integral. Thus I want to try out this excerise on my own using pen and paper. Regarding the use of instead of it is a funny story. Back in high school I had an awful experience with trigonometry and as a result I developed an apprehension to and more specifically to . Years later when I studied chemistry in university I had this physics course in optics where the notation often used is and and since that memories bring me more joy (triggered also as I obtained good grades and developed a close friendship with the professor). I prefer to stick to those letters. Maybe it is just a subjective choice but that doesn't really change the meaning of what it was shown. I hope you understand me. However there is nothing wrong with using the "ordinary and usual" letters such as cosines law which is the only exception I do since it is easy to relate the arabic letters with their corresponding greek equivalents. which amazingly it is very much exactly as what I obtained from your method. The above method which I posted in my earlier comment was based on the fact that if you consider the area of the spiral to be a flat doughnut then this disk when unwind it results in a parallelogram and therefore the height is considered to be the separation between the arms or the tracks and the length is what it is to be calculated. As indicated this is an approximation and is very similar also to the result. However I'm concerned whether how accurate is this approximation since when you calculate the area by considering that it is a disk there is inevitable some sector which is added in both ends as the spiral doesn't end like a circle does. I'm sorry If my questions seem redundant but I'd really hope you can help me to clear out these doubts. I'd like to write down this in my notes book to review it frequently. Your questions are certainly not "redundant"! Good on you for pursuing it until you understand it. Why is not "transformed" or "equated" to whereas in problem is and not that's the thing which I'm not getting it." Your value of 0.026 is the starting value for your spiral, and if it's divided by or anything else, then when (that is, when we substitute it), won't be your starting value any more. Hopefully this picture helps to explain it. I've taken the most fundamental case possible, with and , so the curve is . As values of go from to , you can see we are at on the horizontal axis. Similarly if we go around again, we''ll be at and once more gets us to . That's how polar coordinates work - for whatever value of , we need to move away from the origin by that much. So since one turn is equivalent to radians, then we need to divide our in the equation by for it all to work. If it's still not quite clear, I suggest substituting a bunch of values for and seeing what values of result. There are often 2 or 3 ways to find an answer - I'm glad this post surfaced some of them!